The first Bruce Reid to play VFL football turned out for Footscray in 1928-29, kicking 15 goals in 28 games. A generation later, two of Reid’s sons; John, and Bruce Maxwell Reid, also had notable VFL careers. John played three games with Melbourne in 1972 and 1974, 78 games with Footscray (1975 - 1981) and 10 games with the Sydney Swans (1982 - 1983). Bruce Reid junior followed his father to the Western Oval when he was recruited from Sandhurst in the Bendigo Football League in 1977. A big, blonde defender, Bruce made 86 appearances for the Bulldogs, before falling out with the coaching staff and requesting an open clearance. Footscray agreed, Carlton snapped up the strongly-built 192 cm centre half-back, and Reid turned out to be good value in his three-season stay. 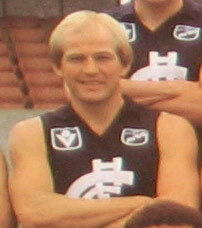 He wore guernsey number 17 in all of his 33 games, highlighted by the Blues first-ever Night Premiership in 1983, and both of Carlton’s losing day finals in 1984. In the second of those, a Semi Final against Collingwood at Waverley Park, Bruce demonstrated that he was either very brave or quite mad when he was reported for striking “Rotten Ronny” Andrews – the fearsome ex-Essendon enforcer who was by then with the Magpies. Reid’s debut game with Carlton in round 1, 1983 was a memorable one, when Carlton met Richmond at Princes Park in a rematch of the previous year’s Grand Final. After seeing our 14th flag unfurled, the Blueboys set about demolishing the Tigers again, and won easing up an even ten goals. Reid lined up at centre half-back, and had the privilege of playing alongside two of the greats in Ken Hunter and Wayne Harmes. Hunter took his breath-takingly courageous Mark of the Year, and a young Mark Buckley kicked five goals in the third quarter at full-forward, after replacing the injured Ross Ditchburn. Reid’s last game in navy blue was another emphatic victory at Princes Park; a 34-point defeat of Sydney in round 18, 1985. While Justin Madden controlled the ruck, bustling Paul Meldrum took charge of the centre corridor and was clearly Best on Ground. Reid played in a back pocket that afternoon, alongside a brilliant youngster in Stephen Silvagni at full-back. Although Reid retired at the end of 1985, he and his family’s influence on AFL football was far from finished. Some 23 years later, Reid's son, Ben, was drafted by Collingwood in the top 10 of the 2006 National Draft. Another son; Sam, was drafted by the Sydney Swans at pick 38 in the 2009 National Draft, and both seem headed for outstanding careers. Both were to become premiership players at their respective clubs. In 1997 the Bendigo FL compiled their best team for players originating from the BFL VCFL zones for the period from 1972 - 1997, Reid was named in the forward pocket in that team. Contributors to this page: Grisdesa , Bombasheldon , Jarusa , PatsFitztrick , molsey , tmd1 , true_blue24 , WillowBlue and admin . Page last modified on Monday 15 of October, 2018 17:24:21 AEDT by Grisdesa. 1987 - Rhys-Jones & Krakouer deserve a go (01/04/87). 1970 GF - Barassi at a break with Crosswell, Waite & Walls.